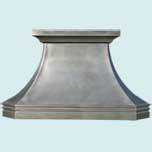 Handcrafted Metal makes stunning pewter range hoods with exquisite detailing and antique finishes. During our 25 years of success we have learned to make metal hoods from a variety of materials, including pewter. We only use high-quality pewter for durability, and you can add detailing, such as hand-forged straps and rivets, to give your custom pewter range hood a powerful presence in your kitchen. To fully accommodate your kitchen, you can completely customize every dimension and feature, and all seams are fully welded and polished. We will work with you to produce a work of art for your kitchen ventilation. To get started, click any of the custom pewter hoods styles below to see a collection of pewter kitchen hoods that we have made in that style. You can then click any of the pewter range hoods displayed to see pricing and customize dimensions and features. Without a doubt that Pewter Range Hoods in French Country style is one of the most popular style among all shapes of Pewter hoods styles we have today. Single Roll Copper Range Hoods style is a very popular Copper Hood if we want to have it installed on the Wall. We have large number of eye catching designs of Pewter Range Hoods in Double Roll Style.Some of the Old World Patina finishes in this copper hoods style looks surreal. 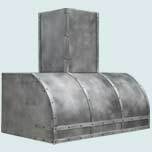 Pewter Range Hoods Sweep Front style is the most sought after design This is the ideal option if you want to install it as a Pewter wall hood. 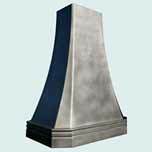 The classic Pyramid Pewter Range Hoods style has been one of the most simpler and popular Pewter Hood design. It gives a powerful presence to your Kitchen.